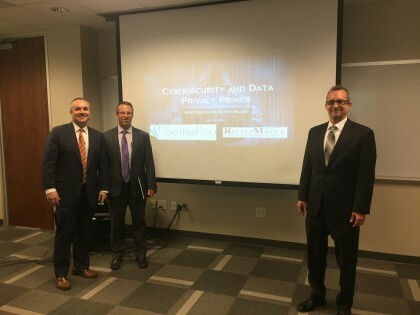 On June 13th, SettlePou welcomed clients and colleagues to its office for a lunch presentation titled “Cyber-Security and Data Privacy Primer”. SettlePou’s clients in attendance represented a wide variety of industries in the local business community. Presenters Dustin Mauck and Mike Regitz are the founders of RegitzMauck, a boutique intellectual property law firm. They spoke about various types of cyber-attacks, how companies can protect themselves, and how to respond if an attack occurs. Additionally, Mauck and Regitz addressed the regulation of privacy in the Gramm-Leach-Bliley Act, the Dodd-Frank act, and the Consumer Financial Protection Bureau. The presenters emphasized that planning and training are the best mitigation tools, including the development of an incident response plan prior to the occurrence of a data privacy incident. SettlePou is looking forward to hosting its next presentation for its clients.